I wrote about my latest shopping trip to Reid’s Stationers in this post, and I liked the Winnable Executive Journal so much I put it into the rotation. Four journals on the go isn’t too many, is it? Nah. I purchased a Fountain Pen Revolution Guru pen from Deb at Goodwriters. It was put in the post earlier this week (it’s coming from Scotland) and I will review it as soon as I get it. 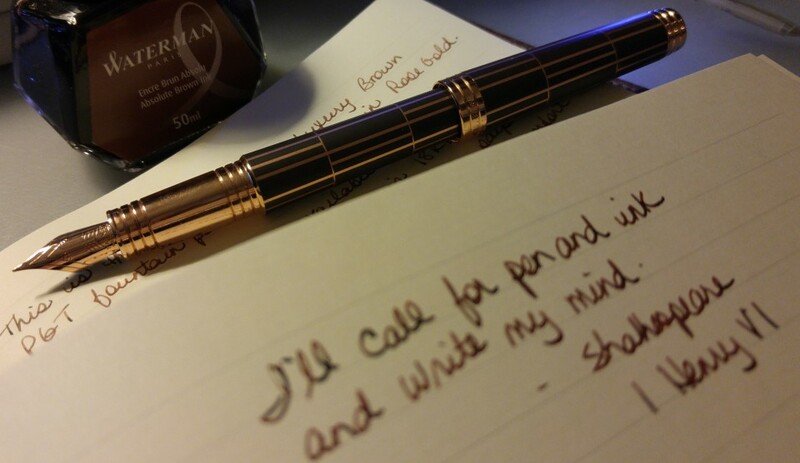 I’m thinking of using my World Mail Panel money to purchase a vintage Waterman from her as well. Stay tuned! Final update on InCoWriMo 2015: As suspected I did not reach 28 by the 28th. I sent 14 and received 7. It has kickstarted my letter writing again so that’s a good thing. I am tackling my Reply To pile with ferocity! We got a new sectional sofa! New to us that is. My very generous co-worker gave us a terrific deal, and moving it was not the nightmare I feared it might be. Although David was injured during said moving of said sofa, he grunted and heaved like a trooper and set it up that same night. It looks wonderful and so comfy! Even the cats approve. Our poor kitty cat is still sick and no one seems to know why. Tonight she is in the hospital receiving fluids and medication, in the hopes she will use the litter box on her own. Fingers crossed.